All you need is just one cartridge? Retro gaming is reaching new heights in popularity. The systems of the 80's and 90's are adored by anyone who grew up in that era, and to younger folk as well. Despite the technological achievements of modern consoles, older games have an immutable nostalgia factor, which, coupled with adulthood, professions, and incomes, is a perfect storm for a retro revival. As fun as it is to relive your youth and re-experience the games you played as a kid, the simple laws of economics come crashing down on you. You are reminded that the number of thirty year old cartridges that are available and still functional are in limited supply. Former best-selling games, produced in the millions, command near retail prices and in some cases, several times that. So what is one to do? Starting a collection now is cost prohibitive, as the best time to collect for a console generation is generally two to three generations after its expiration, and for the 8 and 16 bit generations, that time is long gone. The emulation scene is abundant and as accessible as ever, but to the more discerning gamer who actually remembers what it was like to hold those wired controllers and persevere through blinking screens, actual hardware is a necessary part of the experience. Enter: Everdrive. 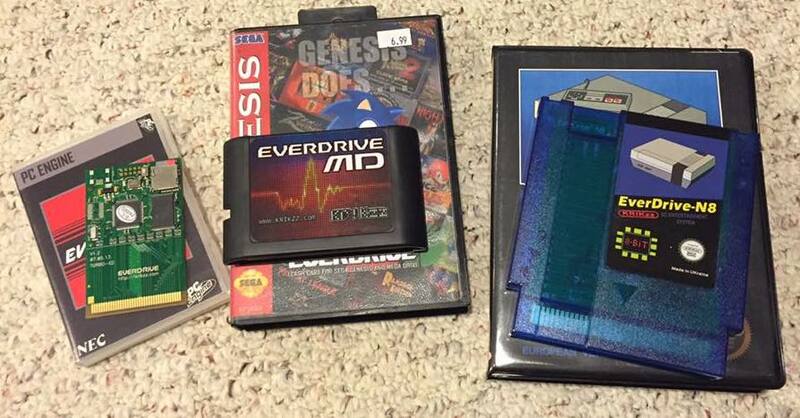 The Everdrive is a flash memory cartridge that allows you to play downloaded roms (presumably backups of games you already own) on original hardware. Granted, the ethics and copyright laws are muddled on these ancient games, and people interpret them differently, and so what you decide to do is up to you. Some argue that playing Everdrives is emulation but that would be incorrect. The rom is identical to those on a cart, and the actual system is doing the same work and outputting the same results as an actual cart would. So it is not emulation, but it is utilizing the widespread accessibility of roms found online. You are playing on an actual console with an actual controller, not at a computer. There are a couple of varieties for each of the console systems, varying in levels of compatibility with certain games that require specialized chips. Even the most basic Everdrive is compatible with about 99% of the console's library. Some game that require specialized chips, like those found in Virtua Racing or Star Fox will not be compatible with the basic model. To play games that require specialized chips, you would have to choose the next tier of Everdrives. Everdrives are made by a Krikzz, who is based in the Ukraine, and he sells online from his store: http://krikzz.com/store/. There are Chinese knock offs floating around online, but I would warn against them as while you may save a few bucks, there is no official support, and they can be bricked by the wrong operating system installed. I currently own versions for the NES, SNES, Genesis, and TurboGrafix. These are all region-free, so formerly region locked games can be played with ease. I can't stress enough how awesome this fact is, for I actually own a PC-Engine Duo (Japanese), not a Turbo Duo (domestic), so to be able to have both available on one system is magnificent. I don't have a monstrous collection like some other retro collectors; I collect mainly the games that I grew up playing or have a preference for (like shoot'em ups, and fighters, and beat'em ups). While I can fit every game on each Everdrive, I don't. Having every single game is too cluttered, and takes too long to search out what I want to play if you load several hunderd roms on it. Not to mention the fact that there is a lot of garbage out there. I made folders for each genre, and I find that works nicely for me. The vast majority or roms that I have loaded on it are games that I own, with some pricey exceptions that I will probably never own. Sometimes I hear good things about a game, and I load that rom to check it out. If I end up liking the game a lot, I'll seek out a physical copy, depending on cost. So, take it for what it is. They may not be for everyone, and that's fine. It is an option available today that was every kid's dream in the 90's. If it is something that you might be interested in, look it up online, watch a YouTube video of one in action, and see for yourself. Classic Gaming Quartley has produced some nice video reviews that are a bit more in-depth than this post, so have a look. Thanks for reading.